There are some viable pricing opportunities now for at least part of the feeder cattle mix to be marketed next spring. October and early November usually mark the peak marketing season for the beef industry. It’s the month where most cow-calf producers are busy weaning calves, preg-checking cows and shipping the calf crop. Those calves go numerous directions, including stocker and backgrounding operations or wheat pasture. Meanwhile, some operations also hang on to their calves through the fall and market them right after the first of the year. Whatever the case may be, calves that don’t head directly to the feedyard will need to be marketed at some point this spring. And that brings us to the state of the feeder cattle market. As noted in a previous column, there are multiple factors that drive the feeder market – and feeder cattle marketing can prove to be complex. But, overwhelmingly, the largest source of variation is derived from deferred Live Cattle futures contracts. 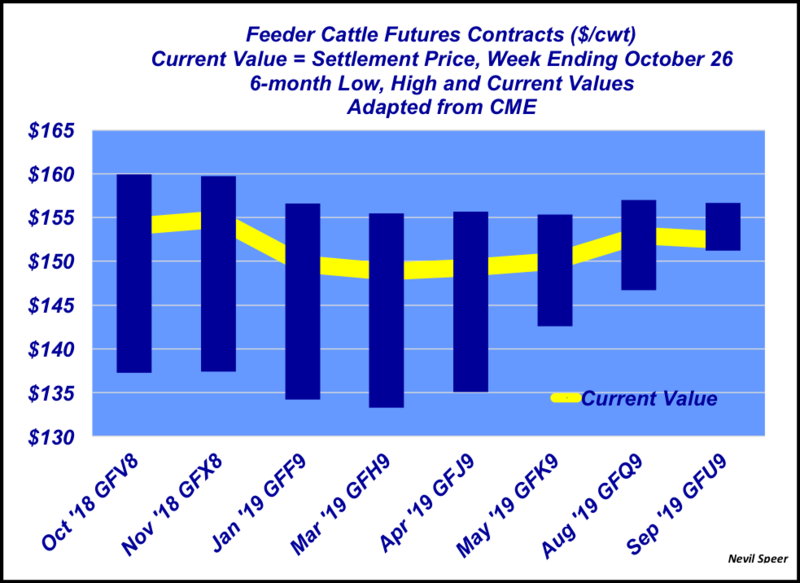 That said, during the past several months, feeder cattle futures have been pulled by strength in the deferred fed cattle market. This week’s illustration highlights respective contract values over the next year: October, November, January, March, April, May, August and September, respectively. What’s important to note is that current values are on the upper side of lifetime contract highs. That’s significant against the backdrop of potentially big placements in early-2019 and a dubious outlook for feedyard closeouts in 2019. In other words, the futures market has moved higher of late; but there exists some noteworthy bearish pressures that could push feeder cattle prices lower in the months to come. That provides some viable pricing opportunities now for at least part of the mix to be marketed. What’s your general outlook for feeder cattle prices going into 2019? If you own cattle to be marketed next spring, how are you making plans to price those cattle? Leave your thoughts in the comments section below.